The star posted this worrying snap of a uniformed officer apparently handcuffing her on Twitter before deleting it an hour later. Oh dear. It seems Lily Allen’s quest for attention-grabbing selfies have caused a bit of a stir. 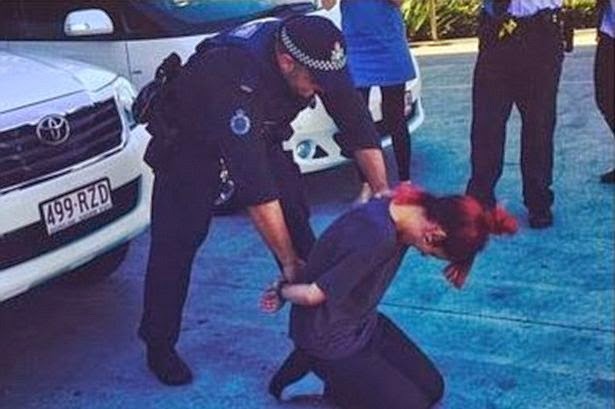 The star, 29, who’s currently touring Australia, posted this worrying snap of a uniformed officer apparently handcuffing her, on Twitter writing “Uh oh”, before deleting it an hour later. But what started out as a joke has turned serious as Aussie police have launched an internal investigation. Eek. The singer landed at Gold Coast Airport in Queensland ahead of her appearance at the Splendour In The Grass festival on Sunday, where she was greeted by a handful of fans and a number of Federal Police officers. Breaking strict protocol, the officers agreed to Allen’s request to be put in handcuffs as she knelt down - and one of her lackies took a photograph, so she could upload it to social media. An Australian Federal Police spokesman said: “On July 27, Lily Allen was escorted by AFP members whilst transiting through Coolangatta airport at her request. “Ms Allen requested a photo op so AFP members placed open handcuffs on her and posed for a photo which breached standard protocols. “Ms Allen has NOT been arrested and is NOT being investigated. Lily Allen's spokesperson was unavailable for comment.